In 1986-ish, while a grad student at Georgia Tech, I happened to take a class in backpacking presented for Outdoor Recreation Georgia Tech (ORGT) by Miller Templeton, who had recently thru-hiked the Appalachian Trail. The instructor had a lot of useful advice about the Trail, and I was eventually inspired to attempt my own thru-hike (though I did not manage to complete the Trail… yet). One particularly handy bit of knowledge was the no-cleanup backpacking dinner system ORGT called “PCG III”, where PCG stands for “Protein Carbohydrate Goulash”. Rather than compile a whole stack of individual recipes for backpacking meals, as presented by some books on trail menus, PCG III is a “one from column A, one from column B, etc” method that produces a potentially large variety of different meals without having to repeat a recipe once on an entire thru-hike. PCG isn’t the only such backpacking meal system– but in my judgement these combinatorial recipe systems could be more widely known on the Net. This system uses inexpensive ingredients commonly found in the grocery store, so packaging several weeks of food won’t require a bank loan like commercial backpacking meals. PCG also has a very long shelf-life, which is important for long distance hikers like myself that prefer to package up all meals ahead of time have them mailed to myself along the trail, instead of stopping every few days to purchase and assemble meals from nearby grocery stores. Assuming I was going to complete the entire trail, I had twenty boxes packed ready to mail to post offices on or near the Trail, and I know from personal experience that PCG has a shelf life of three months and likely much longer. I don’t see PCG III on the ORGT web site, so I present my para-phrasing borrowed from class notes, while giving full credit for the original ideas to the Georgia Tech student group. dashes of spices to taste: oregano, basil, thyme, curry powder, etc. 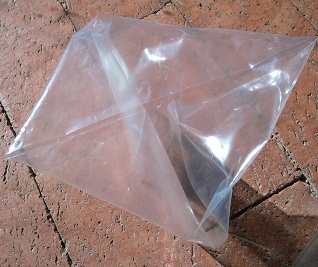 You may simply package everything up into a 1 quart zip bag, but I was taught the following technique: Take a 1 quart freezer zip bag and cut off the zip. A regular zip bag is too thin and won’t work well with boiling water. Cut a 3inch by 4inch rectangle of corrugated cardboard. Push side seams and bottom seams together to form triangles as shown in the photo. Bend a corner over the cardboard and tape. Do the same to the other corner and tape. You should have a bag that will stand up by itself. The cardboard bottom acts as a thermal insulator to make the meal easier to hold in one hand. Place the ingredients inside and secure with a twist-tie. a small packet of instant potato flakes to add in case you accidentally put in too much water. A small plastic container of squeeze margarine (or clarified butter or olive oil), for adding fat calories needed by long-distance hikers. Boil 1 1/4 cup of water, pour into bag, stir gently until mixture is uniform. Add more water if needed, or add a little instant mashed potatoes if too watery. 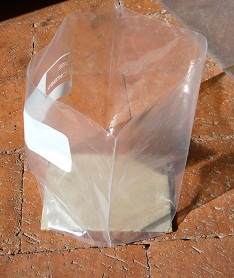 Seal bag with twist tie, allow to re-hydrate for 5 minutes. Add a squirt of squeeze margarine (or clarified butter or olive oil). Stir and enjoy. 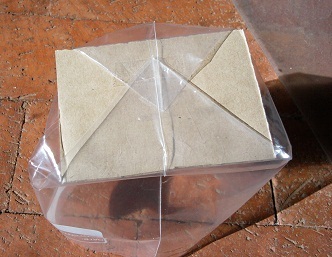 When finished, seal bag with twist-tie, now ready to pack out. Nothing to clean except your spoon. As an example, if you want to make a spaghetti meal, then choose ramen+pepperoni slices+tomato soup mix+dash of Italian seasoning+grated Parmesan cheese+group b. 1) Ham TVP is marketed as imitation bacon bits for a salad topping. Pretty convincing as ham when rehydrated. 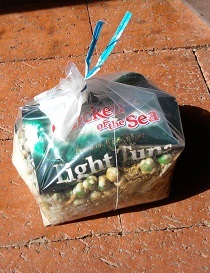 2) If using a can or foil packet of meat, try for packed in oil instead of packed in water. You want the extra calories. Leave the meat in the original container until ready to cook. Add to the goulash after rehydrating, not before. I rarely used grits or cream of wheat. Rice was a favorite. Stuffing was also pretty good. 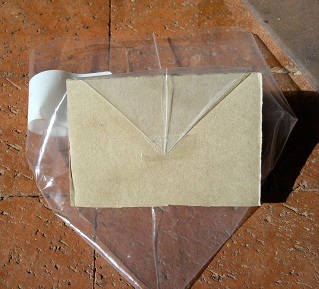 Items with more moisture, such a small can of tuna, were used early after a mail drop to shed pack weight faster. If using now, I might try my own dehydrated soup instead of instant soup mixes, and add some dehydrated peas, peppers, or dehydrated cooked beans/lentils. Or I might reduce the GroupD portion and replace with dehydrated cooked beans or lentils. Will experiment with those in a later post. Might also try dehydrating my own cooked rice, so I could try wild rice, pink rice, brown rice, or (yum!) basmati.